GPS which stands for Global Positioning System refers to a satellite navigation system based on space that is capable of providing information about time and location regardless of the kind of weather and your specific location as long as an unhindered line of sight to at least four GPS satellites is present. This system is now maintained by the US government. It can be freely accessed as long as you have a GPS receiver. The benefits offered by GPS are among the major reasons why this has become so popular at present. Its program is capable of providing crucial capabilities to commercial, military and civil users from different places in the world. It is also referred by many as the backbone in global air traffic system modernization. If you own a GPS receiver, then you can expect it to work in calculating its position by generating a more precise timing for the signals that are sent by reliable GPS satellites. All GPS satellites are capable of continuously transmitting messages that usually include the specific time when the message was transmitted and the specific position of the satellite at the moment when the message was transmitted. It should also be noted that the present GPS system now comes with three basic segments. These are the control segment, the user segment and the space segment. All these are extremely beneficial in your attempt to use the broadcast signals sent by GPS satellites from space in calculating three-dimensional location namely altitude, longitude and latitude and the present time using the GPS receiver. If you want to acquaint yourself with all the aspects related to the Global Positioning System (GPS) technology, then it is advisable for you to consider taking part in the GPS certification program which is now offered by Brainmeasures. The GPS course offered by this reputable online certification company is highly commendable considering the fact that it covers all areas related to the GPS technology including its numerous principles, techniques and applications. With the help of this certification course, you will also get the chance to undergo the company’s impressive GPS training which allows you to improve your GPS skills and expertise needed in various professions and industries including GIS data collection, engineering, land surveying, biology, geology, geophysics and census data collection. The good thing about this GPS certification course is that it is developed by real GPS technology experts so you have an assurance that all the information that you gather from it are of the highest quality. 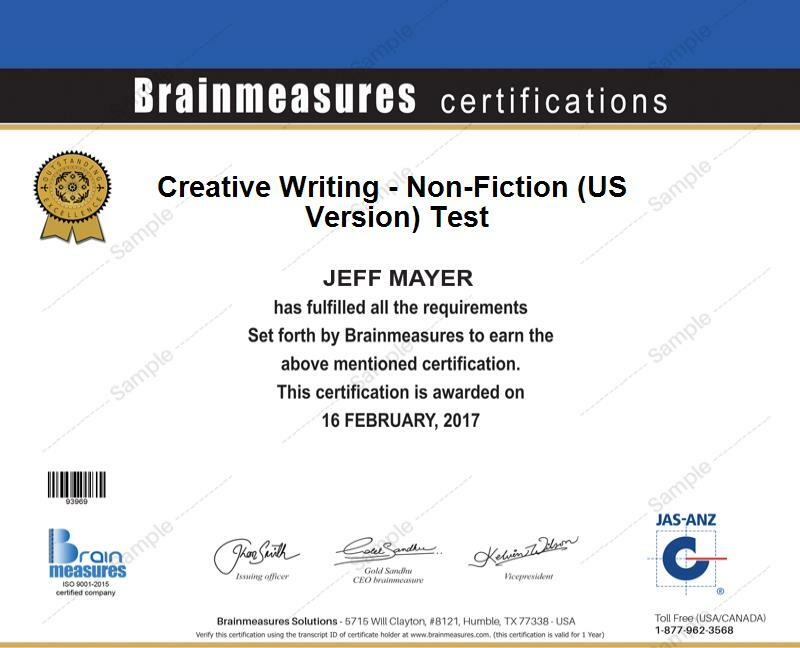 Once you receive your GPS certificate from Brainmeasures, you can start providing your services in this field for a higher fee because you are already a certified professional in this field. How to effectively dissect maps? How to save and edit street maps? The GPS certification program which is now available at Brainmeasures is extremely useful to those who are in great need of a more solid and stronger foundation in GPS technology. Among the individuals, professionals and industries that can greatly benefit from taking part in this program are biologists, consultants, geotechnical engineers, soil scientists, plant scientists, soil surveyors, land use planners, developers, ecologists, city and county government, environmental engineers, environmental consultants and environmental scientists who need to enhance their scientific and environmental knowledge and improve their skills in GPS technology application. The GPS technology industry is also considered as a profitable industry so you have a hundred percent assurance that you will earn a more stable income after you complete a GPS certification course. Your GPS certification is extremely useful in getting the position of a GPS administrator which usually offers an annual salary of around $67,000 to $104,000. Getting the position of a GPS software development engineer is also possible and this will allow you to receive around $82,000 to $118,000 annually.